We are working on a solution to capture messages to off-line users of Microsoft Office Communicator. We would like to capture these lost off-line messages that are never sent to the intended recipient and store them in a Sql database before they become lost or are sent to email. When an offline user of these messages become active, we would then alert the user, similar to IM tools such as Yahoo Messenger. We are working with MSPL (Microsoft Sip Processing Language), which is a scripting language used for filtering or routing SIP messages combined with C# to capture the message. For delivering messages, the UCMA API is used. We have bumped into some hurdles for capturing the messages, for instance, we were able to capture the message and the user initiating the message to the recipient but the message seemed to be encrypted in a UTF-8 format. We found a way to decrypt this message using the Class library in C# called system.text.coding and is now readable in a plain text file. Now that the hardest part is over, or so it may seem, we can concentrate on sending them to the recipient when he/she becomes online. We will need to monitor who becomes online and send these messages using a windows service. The good news is, we already have an application that monitors offline users and sends an alert to these users, when they become active. 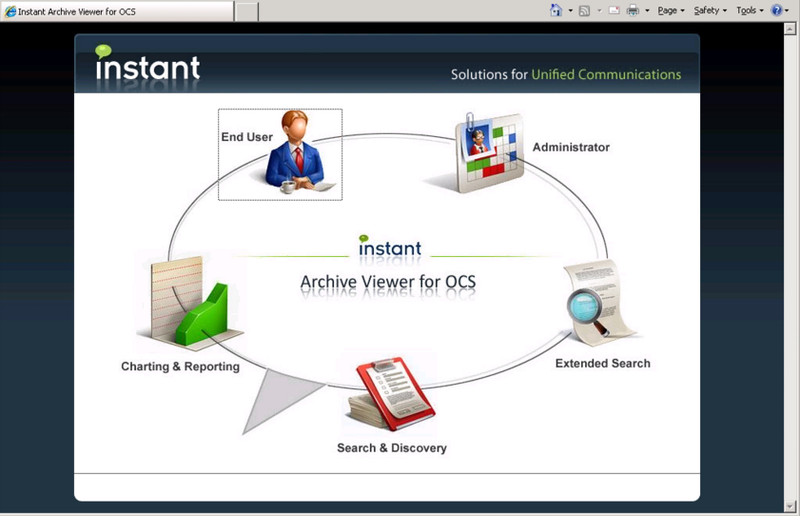 It is called Instant Alert Manager for OCS so this is not entirely new territory for us and has given us a head-start. There is still quite a lot of work to do. For example, storing data in a Sql Database and creating tables to store the data and deleting the data after the information has been sent. 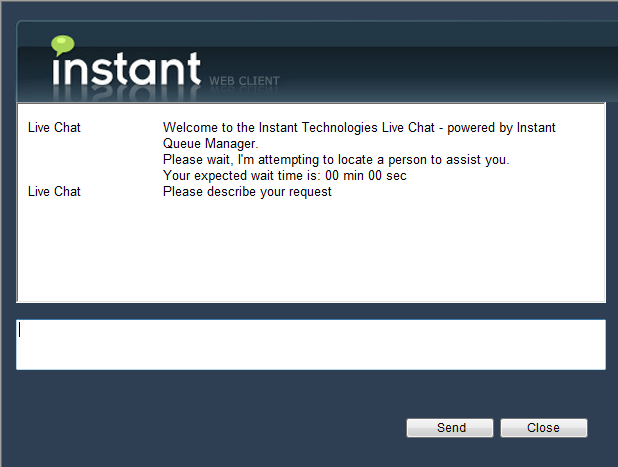 Also, capturing messages sent to users in various states, ie., busy, do not disturb, be right back. What if, users are a way on vacation, what to do with these messages, should there be an expiration time and then have the messages sent to an email, etc., etc. Nevertheless, much progress has been made in a short time and we will continue to find the best solutions. We will continue to update our latest findings and possibly give more details as we progress. 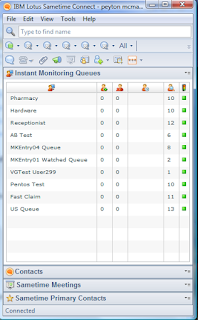 This week, we have been extremely busy adding additional enhancements to Queue Manager V4. All of the enhancements are a direct result of customer feedback and customer requests. 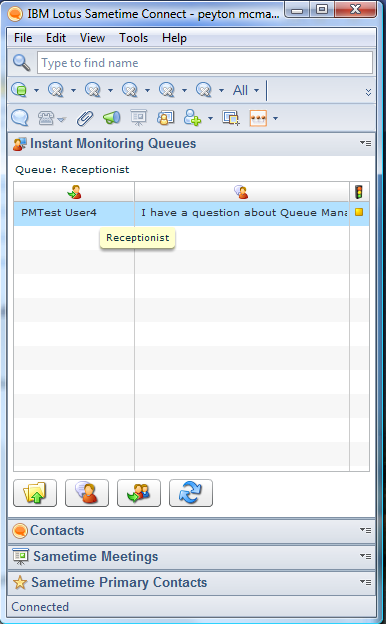 By default, the system has been enabled to notify experts when a person is waiting in the queue. The broadcast options for the queue will determine the expert notification settings. We know that the notification system for experts is very important and we will continue to invest time, and design ideas, on this area. In addition to sending IM alerts on Sametime, Microsoft OCS, and XMPP, we now also support the ability to alert experts using Twitter. If the expert is not online in an IM system, then we can send the expert a tweet and let them know that someone is waiting in the queue and needs help. Our directory system now supports some additional fields necessary for the Twitter support. 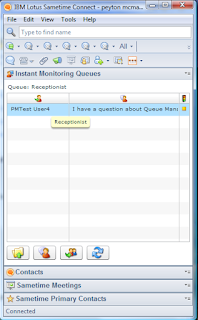 Updated the plug-in to support Sametime Connect 8.5. 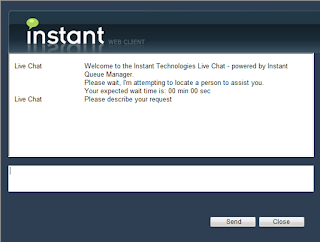 The updated plugin also supports server based text replies, the ability to accept multiple chat conversations, and the embedded monitoring panel. 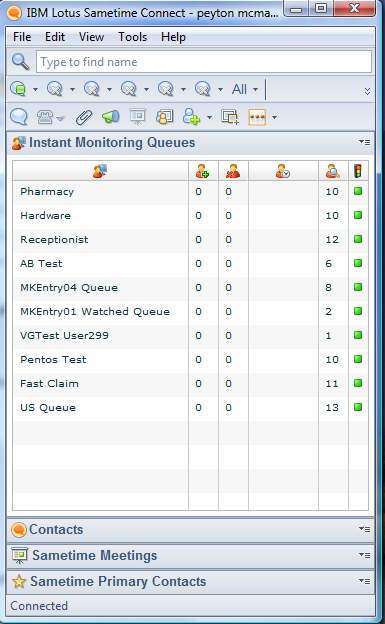 The monitoring panel has also been updated to show the high level queue activity as well as a drill down details level view of each queue. In order to help provide experts with standard replies, we have added the ability to store, and manage, server based text replies within the administrative system. These server based text resources are integrated into the Sametime plugin. Updated ITF so that newly created Queue comes online without restarting Apache. More information on surveys will be available next week. 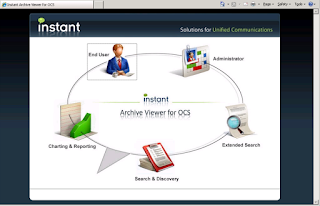 We have recently made several updates to our Archive Viewer for Microsoft OCS. Most of these updates are based on customer feedback. Within our scheduling and mailing system, we now support authentication via public AD groups. Several of our customers required keyword searches within groups and then schedule those keyword searches on a daily or weekly basis. Prior to this update, pubilc group queries were not supported. 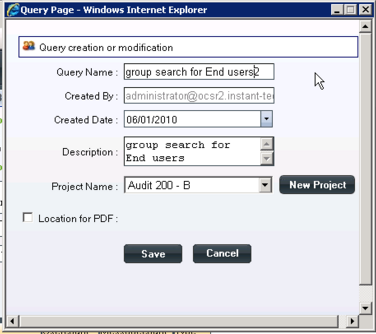 We now support scheduled keyword inspection against public groups defined in Active Directory. We have also added a central landing page to help provide a more centralized user experience.